Toyota Australia has announced the addition of the Prius V seven-seat family variant to the local lineup, with an arrival time of around May. The Prius v wagon seats five passengers, with 50 percent more interior cargo space than the current Prius. It will be powered by the same powertrain. 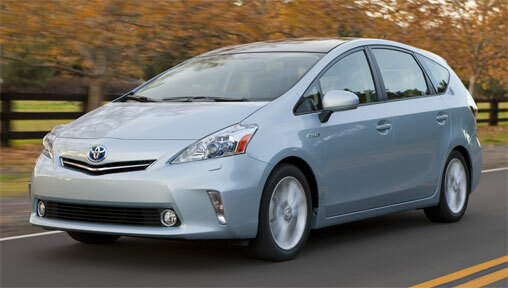 The Toyota Prius V is the first Toyota hybrid to land in Australia with lithium-ion batteries. The new battery packs (which are lighter and more advanced than the nick-metal hydride battery used in the current Prius) are located in the centre console between the passenger and driver. "Due to the placement of the lithium-ion battery pack between the front seats, there is minimal compromise to the MPV-style seven-seat passenger accommodation or the load space," Toyota Australia's Matthew Callachor said. "Families will have the flexibility of using all seven seats or folding down the third-row seats to convert the car into a five-seater with extra luggage space." "Customers can also fold down the second-row seats to accommodate more cargo than many SUVs and wagons on the market today." Fuel economy figures are still unconfirmed, but in the US cycle the Prius V uses 4.6L/100km (compared to 3.8L/100km for the Prius’ US cycle), so we suspect the fuel figure to be in the mid to high fours when it goes on sale in Australia. Toyota Australia’s executive director sales and marketing Matthew Callachor said the Prius V is set to retain the original’s emphasis on fuel economy and environmental performance. “Due to the placement of the lithium-ion battery pack between the front seats, there is minimal compromise to the MPV-style seven-seat passenger accommodation or the load space,” Mr Callachor said. Pricing for the Prius V is still unconfirmed but in other markets the Prius V has gone on sale for similar or even lower prices than the Prius hatch ($35-46,000).